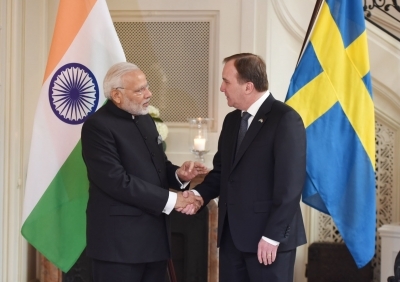 Stockholm April 17 (IANS) Aiming to build a win-win partnership through Sweden making use of the opportunities offered by India s development programmes the two countries on Tuesday signed a Joint Action Plan and an Innovation Partnership following a bilateral summit between Indian Prime Minister Narendra Modi and his Swedish counterpart Stefan Lofven here. Jointly addressing the media here along with Lofven after the talks Modi said that Sweden has been a strong contributor to the Make in India programme from the beginning and recalled that the Swedish Prime Minister himself led a big business delegation to the Make in India summit in Mumbai in 2016. "The main theme of our discussions today was how to develop a win-win partnership between Sweden and India through the opportunities offered by India s development programmes " Modi said. "As a result we agreed to a Joint Action Plan and an Innovation Partnership." Stating that innovation investment start-ups manufacturing were among the main areas of cooperation between the two countries he said that attention was also paid on renewable energy urban transport and waste management to improve the quality of life of the Indian people. "Defence and security is an important pillar of our bilateral reltionship " Modi said. "Sweden has been partner of India in defence sector for a long time. I am confident that new opportunities for cooperation in this sector will arise in the future especially in defence production." Stating that Sweden is an important partner of India for defence and security the Indian Prime Minister said that there will be new opportunities for defence production in the future. According to Modi both sides also agreed to further strengthen security especially cyber security cooperation. "One more thing that we have agreed upon is that the importance of our relationship should be reflected at the regional and global levels " he said. "We have been been closely cooperating on the international platform and this will continue." On his part Lofven said that he believed that Sweden and India make a perfect match. Stating that India is undergoing an unprecedented economic transformation he said that Sweden has a lot of innovative solutions to offer in this connection. "I am very pleased to announce that the Swedish government will kick start our Innovation Partnership by providing up to 50 million Swedish kronor (Over $59 million) for innovation cooperation with India in the field of smart cities and sustainability " Lofven said. Earlier in the day Modi called on Sweden s King Carl XVI Gustaf at the Royal Palace here and the two leaders exchanged views on strengthening bilateral cooperation. This apart Modi and Lofven will attend a round table of Swedish CEOs. India and Sweden will on Tuesday also co-host the first ever India-Nordic Summit where apart from Modi and Lofven the Prime Ministers of the other four Nordic countries of Denmark Finland Iceland and Norway will also be present. Modi will hold separate bilateral meetings with the leaders of the other four Nordic countries on the sidelines of the summit. The Indian Prime Minister arrived here on Monday evening on the first leg of his three-nation tour of Europe that will also see him going to Britain and Germany. This is the first prime ministerial visit from India to Sweden in 30 years after that by Rajiv Gandhi in 1988. After attending an Indian community event here late on Tuesday night Modi will depart for London on the second leg of his tour.